Cozumel is the home to a strange lizard, the Huico, also know as the Cozumel Race Runner, or if you are of a scientific state of mind, the Aspidoscelis cozumelae. The small lizard is found in the beach dune areas and alongside roads, where it hunts for insects in a fairly tight home range, usually just a few tens of meters in circumference. The Huico’s life is short; less than 5% make it past their first birthday. The species is a product of natural hybridization. Sometime in the past, a female Aspidoscelis angusticeps (or Yucatan Whiptail Huico) from Puerto Morelos and a male Aspidoscelis deppii deppii (or Black-belly Race Runner Huico) from Cozumel got romantically involved and the female Yucatan Whiptail Huico laid a clutch of eggs. The bizarre result (amazing what they can find out through genetics these days) was that when the eggs hatched, they were all female. This batch of sister lizards became the first members of the new hybridized species, the Huico named Aspidoscelis maslini. Being all females, one would think that that would be the end of the line for this particular experiment by Mother Nature, but no; these lady lizards had a trick up their sleeves (tails?) that would save them from extinction. They were parthenogenetic! Parthenogenesis is the scientific term for nonsexual reproduction. Virgin birth, in other words. These Aspidoscelis maslini mamma Huico lizards don’t need Huico daddies to make baby lizards. In fact, male Huicos don’t even exist! Each female Aspidoscelis maslini laid eggs that contained only exact copies of her own genes, thereby cloning herself. After many generations of Aspidoscelis maslini cloning herself time after time, a spontaneous mutation slipped into the genetic code of one of the clones. Whatever the cause of the mutation was (too much tropical sun? Too much diet soda? ), it was enough to differentiate the offspring of this particular clone from all her other sister clones. The eggs of this new, “Virgin Mary” Huico carried her newly-altered genetic information and hatched to produce exact copies of her, ad nauseum. 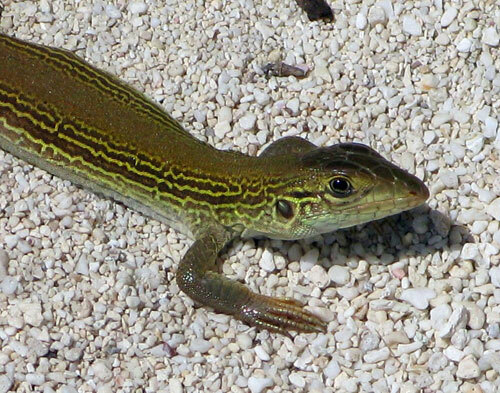 We now call the all-female descendants of this “Virgin Mary Lizard” Aspidoscelis cozumelae, or Cozumel Huico.